Autopumpkin Released many universal android 5.1 autoradio gps dvd player.Today we’ll talk about this 6.95 inch android 5.1 universal double car dvd player-RQ0268E. Set off looking to replace my car stereo for no reason but to gain a USB port. I would have been happy keeping my original stereo if there was some way of just adding a USB port. Almost bought a stereo at the superstore even though I didn’t like the look of them much. My original stereo was a Sony CD MP3 player with eight in-door speakers, fitted in a 56 plate Ford Focus Ghia hatch. A really good factory fitted system, but I was always burning CDs. My main worry purchasing this autoradio gps 2 din was losing the powerful bass. That concern was quickly put to rest with my favourite music app installed. I am able to tweak my music to perfection, bass, treble and everything in between. The FM radio is not nice to look at or tune, programmed stations disappear and signal seem weak. There is RDS though so you can stay up to date with the latest traffic situation. Luckily there are Internet radio apps that work well. There is a Pumpkin Ford Focus specific stereo with the same dimensions as the original but that runs on Windows CE software and I was fearful of ending up with a sat-nav I didn’t like and couldn’t change. iGo is the best or certainly among the best. It is accurate, search is very good, voice natural, almost overwhelmed by the options/customization this navigation software with live traffic offers (it sometimes reports incidents on French instead of British roads) . If you have a car like mine remove the glove compartment and stick the satellite antenna to the metal bar beneath the dash. Locks on to satellites instantly. Loads of storage options are available. There are two SD card slots at the front and two USB ports at the back. I was hoping to place the bluetooth mic above the windscreen by the rear view mirror but the cable is far too short so it got stuck behind the steering instead. Sound quality is not great on incoming calls, not the pure, clean sound in tbe factory fitted Peugeot 3008 system. It works alright though. Cannot access my phone book. Don’t care, I am not much of a talker. Trying to save money I opted to install this unit myself even though I didn’t know what I was doing. It is basically plug and play. I don’t know the technical terms for things so I will leave that alone. I had to buy a couple things for the cable and radio antenna to fit. Could have all been had for under £10.00 if I didn’t need my steering wheel controls to function with the stereo. As it turns out I spent more for a steering wheel adapter and still cannot fully programme the buttons. Not sure if the adaptor, stereo software or yours truly is at fault. I had to strip and crimp the steering wheel control (SWC) wires myself. Bought a crimping tool and learnt on the job. At the start of this all I wanted was a cheap USB input for my stereo. What I have now is a lot more fun but a lot less cash (I really don’t think £200+ is cheap regardless of what they sell for elsewhere). To install the unit I removed the old one of course, attach supplied brackets to either side of the new one and fitted using two longer screws than the ones I removed from the old unit. There is not much room back there so cables have to be creatively tucked in any available cavities. Be careful not to knock out any of your car’s electrics, a/c, hazards etc. As for the fascia I could not find one to properly fill the gap left around the stereo. There is a supplied paper user manual and a PDF version pre-installed on the stereo. Grammar is not always good but neither is mine. Nothing will be lost. It’s fine. Really nice system quirks notwithstanding. 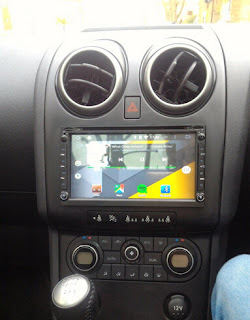 Auto accessories can work with this unit: Headrest monitor,rear view camera, OBD dongle,3G dongle,DVR camera and so on. Heute sprechen wir über eine neue Pumpkin 10,1 Zoll Kopfstütze Monitor, CH1002B. Diese dvd player auto kopfstütze wird von 10,1 Zoll kopfstützen dvd player-CH1001B geändert. Der Unterschied ist, dass dieses kopfstützenmonitor verfügt über Touchscreen. Gott sei Dank! Beschaffte ich den kopfstützenmonitor bevor die lange Fahrt von Berlin nach Weitendorf. Das freche Kind wurde uns auf jeden Fall nicht durch ungeduldiges Schreien vom Fahren ablenken. Die Eigenschaften des Players haben mich überzeugt und deshalb mit dem Punkten natürlich nicht geize. -Mit Touchscreen ist es einfach zu bedienen. Sogar unser 5 Andreas kann das Gerät selbst steuern. -Adapter für den Zigarettenanzünder, bzw. Sromkabel ebenfalls im Lieferumfang enthalten. – Was überrascht ist der Monitor spielt nach dem abstellen automatisch weiter wo das Auto abgestellt wurde. Bin sehr zufrieden und würde es nur empfehlen. Die Monitore haben die Erwartungen voll und ganz erfüllt. Einfache Bedienbarkeit, super hochauflösende Grafik und selbst bei schneller Fahrt über schlechte Straßen oder Kopfsteinpflaster oder sonstiges sind die DVD’s kein einziges mal gesprungen. Wir sind sehr zufrieden und überzeugt von dem Produkt und die Kinder sind begeistert!